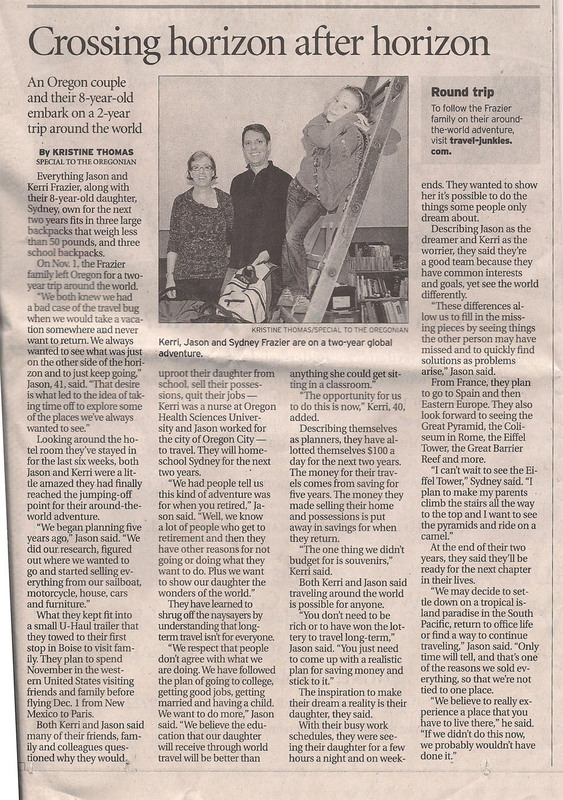 A couple of days before leaving Portland to start our around-the-world adventure, the Oregonian Newspaper got word about our trip and wanted to interview us for an article. We agreed and the reporter, Kristine Thomas, met us at our temporary apartment, Beervana. We didn’t know what to expect, as we had never been interviewed by a newspaper before, but Kristine showed up and it went really well. It turned out that she was well traveled and we had a great time answering her questions and talking about our upcoming trip and she told us about some of her own adventures while traveling. Afterwards, we posed for some photos and that was that.